View these outstanding pictures of saltwater aquarium fish in these photo galleries. These pictures were submitted to About Saltwater Aquariums for display in photo galleries. While some species can be difficult to keep in a saltwater aquarium, Angelfish are among the most popular fish for marine aquariums. The Top Saltwater Angelfish Picture Gallery contains outstanding photos of a wide variety of marine Angelfish. These fish pictures were submitted to About Saltwater Aquariums for display and contest entry. Sifting sand for food, Blennies are a terrific saltwater aquarium fish. The top Blenny photo gallery contains outstanding fish pictures of a wide variety of Blennies submitted to About Saltwater Aquariums for display and photo contest entry. Due to their habit of picking at coral polyps, Butterflyfish are not recommended for reef tanks with corals. Here are outstanding Butterflyfish pictures submitted for display in the About Saltwater Aquariums in the Top Butterfly Pictures Gallery. There is no doubt you'll enjoy browsing this outstanding collection of Clownfish or Anemonefish species photos that were submitted by site visitors for display here at About Saltwater Aquariums. A majority of the images picture the Clown Fish with a host sea anemone, as well as a wide variety of corals. Gobies are terrific reef tank safe fish. There are some beautiful pictures of these colorful little fish in the Top Gobyfish Photo Gallery. Here are photos of a number of Hawkfish which are found in the ocean as well as in the aquariums. Most Hawkfish are docile by nature and make good tank mates. 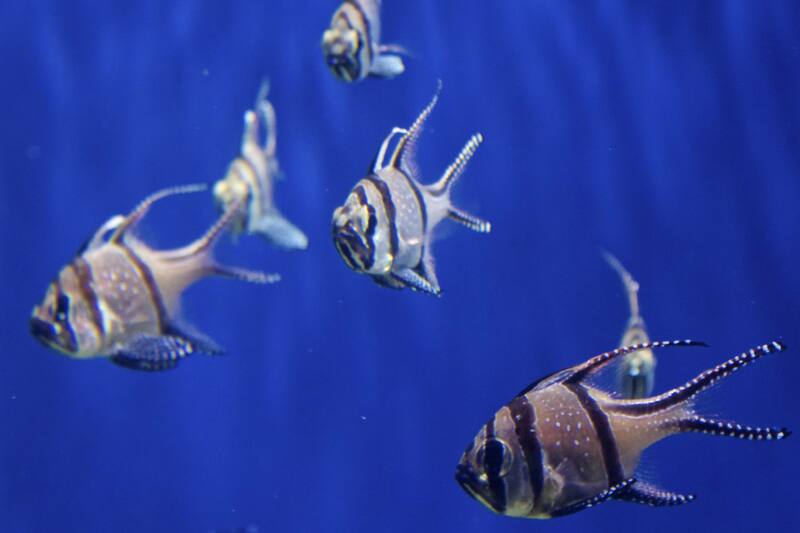 Enjoy these fish pictures submitted by About Saltwater Aquariums users. A gallery of the top Lionfish pictures, photos submitted for display to About Saltwater Aquariums. These outstanding pictures of Lion Fish are of the aquarists' Lionfish in their own tanks. The venom from the dorsal of the Lionfish is very toxic. You will find some outstanding pictures of Surgeon Fish (Tangs) in the Surgeonfish Photo Gallery. These fish are a staple fish in reef tanks due to their lack of appetite for coral polyps.